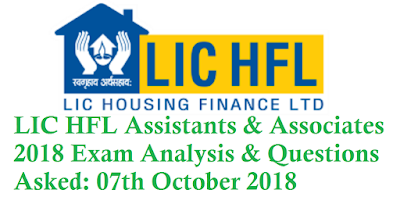 Dear Students, LIC HFL Assistants & Associates 2018 Online Examination is conducted today on 07th October 2018, Sunday. We are sharing detailed exam anlysis of this examination. Overall difficulty level of this exam was of easy to moderate level. 1. Who is the President of Australia? 2. Name the Chairman of SEBI? 3. On which date Indian Army Date is celebrated? 4. Full form of TPA is _________? 6. Name the UN Brand Ambassador for Asia Pacific? 7. Who has bee awarded by Dada Saheb Falke Achievement Award? 8. Best Film for OSCAR? 9. P Kashyap is related to which sport? 10. Name the state who has increased the upper age limit for retirement? 11. Most trusted Private Sector Bank Name? 12. What is the name of the Jacket made by DRDO? 13. Name the App developed by EPFO? 14. Which bank has launched divital form to open current account? 15. Harela Festival is celebrated in which state? 16. First city to adapt BS6 fuel? 17. Deduction limit increased from 30000 to _________ on health u/s 80G? 18. World Government Meeting will held after how many years at once? Questions Asked: Will Update Soon!